CLEARCREEK TOWNSHIP, Ohio — Police urged caution in Clearcreek Township Wednesday afternoon after a large bull escaped its pasture. 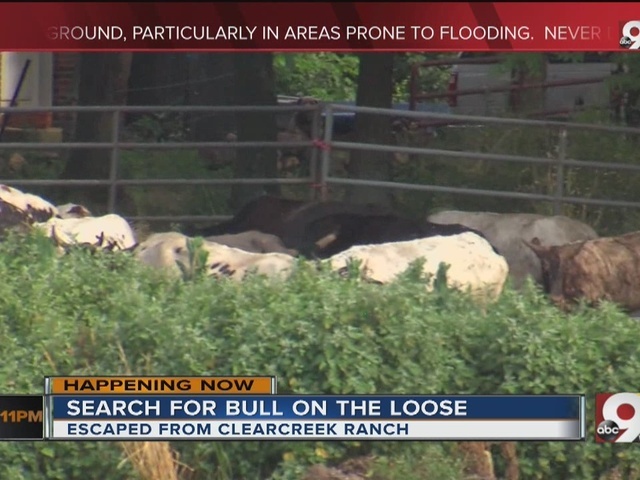 According to Clearcreek police, the bull escaped from its enclosure at Fox Hollow Rodeo, in the 1900 block of E. State Route 73. Police said those in the area of E. SR 73, E. Lower-Springboro Road and Bunnell Hill Road should be on alert for the animal. Police urged anyone who sees the bull not to approach. They said the bull was last spotted in the wooded area bordering Patricia Allyn Park just south of Fox Hollow Rodeo. “This is a bucking bull, bred for rodeo work, and should not be approached,” said Clearcreek Police Chief John Terrill, in a statement Wednesday. "We just want people to know that, if they do see this thing, to call us and let us handle it," said Sgt. Wally Stacy, also with Clearcreek PD. "He didn't leave the petting zoo, so we don't want you going and approaching him. We want you to call us and let us handle it." Police said the animal’s owner dispatched a recovery team after discovering it had escaped. Residents should contact police if they see the bull. WCPO will update this story as it develops.